During the last week of October 2016, a small group from St. John’s traveled to Haiti as representatives of the St. Matthias Partnership. The travelers included Laura Swiggett, Jamie Wylie, Isabel Hanson, and Rev. Gideon Pollach. Over the course of three short days, we had productive and informative meetings with a range of people and organizations to discuss projects related to our recently-submitted Rotary grant. We visited a Haitian-owned solar company, met with a local engineer who oversees well-digging projects, and discussed possible collaborations with the Assistant Director of Zanmi Agrikol (an agricultural research and training academy that could be a great resource for endeavors such as the goat project at St. Matthias). We also had the opportunity to join the Rotary Club of Mirebalais for their weekly dinner meeting, where we discussed the Rotary grant and watched a video about the grant by Michael Fairchild. Perhaps most importantly, we had a chance to sit down with the lay leadership of St. Matthias to catch up on news from Deslandes and discuss next steps for the Rotary supported projects. We also spent time reflecting on the partnership and making plans for the future with Pere Alphonse, the priest who oversees the St. Matthias church and school. We returned energized and excited about the work ahead, which the lay leaders described as “essential” to the development of their community. Shoulder to shoulder, we can accomplish great things. Bon swa! We arrived safely and all is well. We just visited the only manufacturer of solar panels in Haiti – very interesting! On our way to lunch in Croix des Bouquets, then on to Mirebalais. Our driver/translator, Cyril, is terrific. We are in exceptionally good hands. More later! We had a long but very good day yesterday. Gideon is so happy to be back among old friends in Haiti, and to be here with St. John's. Lunch yesterday was one of the most delicious meals we have ever had in Haiti – goat or chicken (choice!) in a zingy passion fruit ginger sauce with pikliz (spicy pickled cabbage), rice, fresh avocado, tomato papaya salsa and fried plantains – yum!!! Peter Charles, we MUST figure out how to make that sauce! And, by the way, we also had some meetings We had a long conversation with Pere Alphonse about communication and how to manage the Rotary projects. Eudras and Rotary engineer Dorce joined us for dinner. More talk about water and solar and, most importantly, how to build an effective team among all the stakeholders. We will go to La Chapelle this afternoon to meet with St. Matthias lay leaders to further that conversation. Rotary dinner tonight, then home tomorrow – a whirlwind! But so necessary. Now, back to Haitian coffee and the wonderful sounds of Mirebalais waking up – animated market sellers, school children laughing, motorcycle taxis, banana trucks, honking horns, roosters. Such a rich cacophony! Greetings from the Port au Prince airport! Yesterday was a full and productive day. In the morning, we visited an offshoot of Partners in Health called Zanmi Agrikol, an agricultural research and training academy that may be a good resource for us in things like the goat project. We visited the Peligre Dam where the Artibonite River begins and drove through the original Partners in Health site in the town of Cange. In the afternoon, we met with the St. Matthias lay leaders. 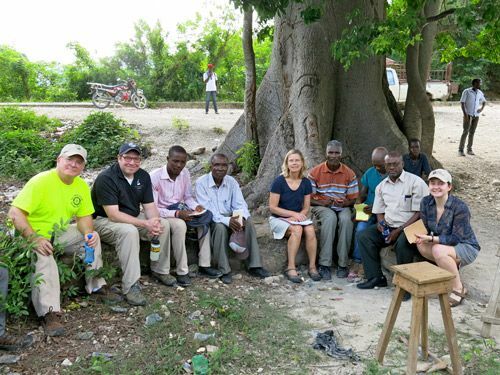 Seated in a circle under a tree, we caught up with our friends from Deslandes and discussed next steps for the Rotary project. In the evening, we joined the Mirebalais Rotary Club for their weekly meeting at the Hotel Mirage. After a delicious meal, Jamie presented the project and we watched the video put together by Michael Fairchild. We then met with the well digger who has great confidence that there will be accessible water in Deslandes. We ended the night by doing "check-in" by the Mirage pool, catching our breath after a busy day. We are sad to be leaving Haiti so soon, but look forward to reflecting on all we have seen and learned with you all upon our return!